I found William Neville’s home in Mountmellick! I have been looking for a map to correspond with the deeds for William Nevill/Neville for over a year now. I found it today – Lot 5, numbers 21, 22 & 24! 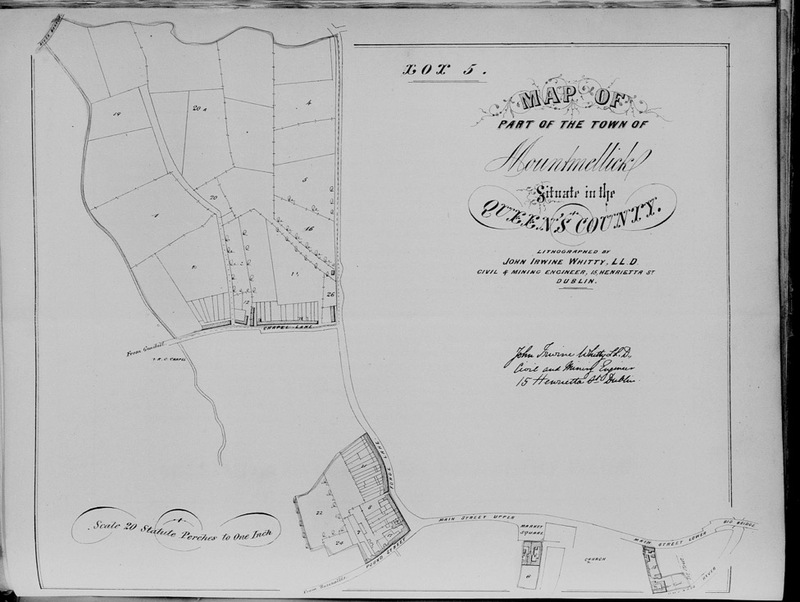 On landed estate records – Alexander Bewley & Henry Bewley were renting the land. I have a copy of the lease from 1743 where William Nevil, the elder, a cloatheir named his three sons, Henry, William and Joseph. William was married the first time in 1702 to Elizabeth Pleadwell, and the second time in 1719 to Anne Atkinson. I have been trying to figure out exactly where the land was, but from the original lease it was a little hard. Using a current map of Mountmellick – “Main street upper” is now Patrick Street. “Pound Street” is now O’Moore Street. “Forge Lane” is now Emmet Street. “Chapel Lane” is now Chapel Street. Lot 21 contains the 20 small cabins, yards and gardens. I can not wait to go to Mountmellick and now I can walk the land that William leased in 1743! I just love land records and maps – they add so much to genealogy research!